Tyler Shepherd of Northern Indiana, is no stranger to hunting big deer. 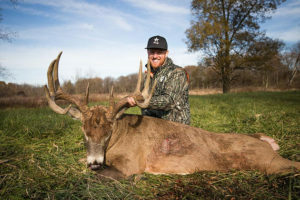 He began chasing whitetails at the age of 10 on his family farms and ever since that first day afield, he had a bow or gun in hand enjoying the great outdoors. His passion for whitetails quickly turned to an obsession, and so began the year-round pursuit of managing farms, acquiring leases, and putting in the work to develop the local deer herd. 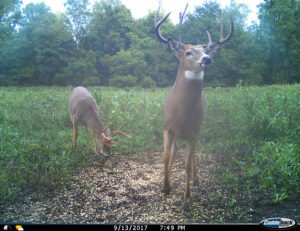 When Big Tine first came on the market years ago, Tyler began buying 40-pound bags of Big Tine 30-06 as a means of supplemental feeding in an effort to grow bigger, healthier deer. Starting with 200 pounds every two weeks throughout the Spring and Summer, Tyler implemented a long-term strategy for hunting mature bucks. 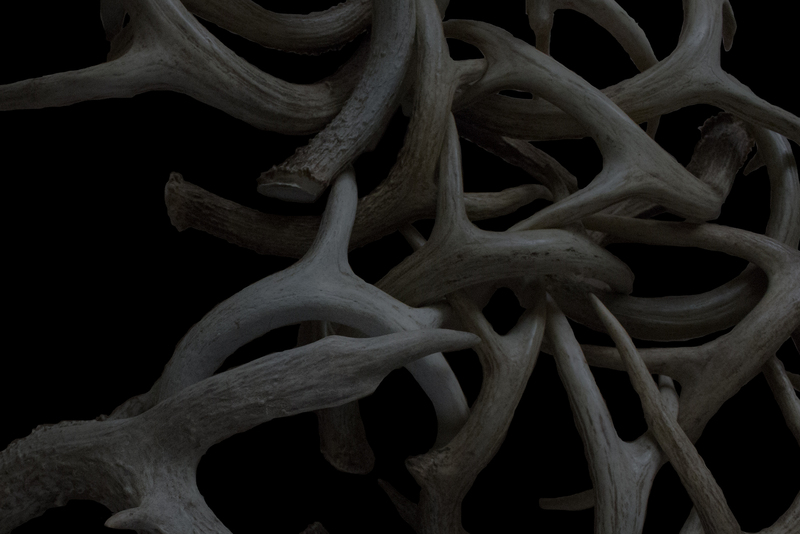 Fast forward to Winter of 2016, Tyler acquired a new farm close to his home and later that Spring, him and his wife Jessica began scouting the property and managed to pick up a number of shed antlers, which included a match set off a younger eight-point. As the Spring thaw turned into Summer heat, they began getting pictures of a three-year-old deer of which they named, “Big Tex” due to his long beams and spindly wide beams that resembled a deer straight out of Texas. His 120” frame and slender body was a dead giveaway that he wasn’t quite mature, so both Jessica and Tyler decided he would get a free pass for the year. As sure as the sunrise, Big Tex was the most visible deer on trail cameras and they would often see him while hunting that Fall. Big Tex made it through the 2016 deer season unscathed and healthy. During March 2017, Jessica and Tyler once again picked up his sheds and looked forward to seeing what he would turn into as a four-year-old. 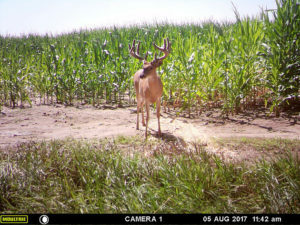 Supplemental feeding continued throughout the Summer along with sightings of Big Tex via trail camera so by opening day of bow season, the anticipation of getting a shot at the deer was at an all-time high. Big Tex packed on the inches with help from Big Tine 30-06! made his appearance and slowly worked into bow range. With him calmly feeding and quartering away, Jessica drew her bow, let an arrow fly and watched the arrow bury into his chest. The shot looked good but after 150 yards of tracking, they lost blood and called in a dog to pick up the search. Unfortunately after many hours on foot, they did not locate the deer that night. The following day Tyler and his buddies grid searched the area, covering over ten miles without a trace. Over the next week, they searched and searched but could still not locate the deer. Confident that the deer was dead, they notified neighbors to keep an eye out for Jessica’s buck.  About a month later in early November, Tyler received a call from a neighbor down the road and he told him to stop by and not thinking much of it, he drove over after dark. While his neighbor was out hunting that evening, he came across Jessica’s buck 800 yards from the food plot she shot him in! The 130” class frame of Big Tex was finally recovered and was dropped off at the taxidermist to get mounted. 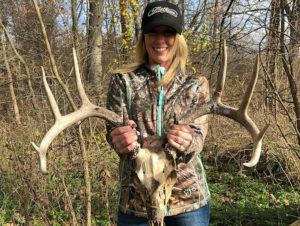 Although they were not able to recover the deer immediately after the shot, Jessica vowed not to shoot another deer that season until she found her buck. Confident in her shot placement, she knew he was dead and it was only a matter of time before he turned up. As luck would have it, she remained persistent and was able to recover the deer with a little help from a close neighbor. Never give up! Jessica was finally able to recover Big Tex a month later when a neighbor came across him while hunting.  The excitement that comes with picking up a new lease is like Christmas morning to a serious deer hunter, and in the Spring of 2017, Christmas finally showed. That March, Tyler signed a lease totaling 340 acres but upon the initial walkthrough, no sheds were found. This left Tyler with a feeling of uncertainty but upon scouting the property further, the rut sign was stellar and hopes ran high for the season to come on. Waldo was primarily nocturnal and only showed himself a few times during daylight hours on trail camera. Early October, Tyler found himself sitting observation stands to see if he could lay eyes on the Waldo but he never showed, so he planned to take a full-week off of work during the second week of November to figure him out. The very first morning of his rut vacation, Tyler headed into the farm with his cameraman Alex Wells but after the commotion of getting two stands hung, they feared they had blown every deer out of the area before daylight. An hour after first light, they had seen nine does and a small buck, so they settled in for an eventful day. 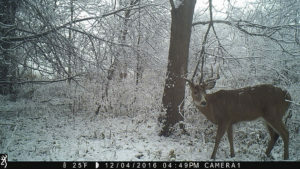 Later that morning, they caught movement in the timber and quickly realized it was the deer they were after, Waldo! After watching him slowly work his way into their position, Waldo entered a shooting lane at 40 yards and Tyler sunk an arrow behind his shoulder. The celebration began but they didn’t see him fall, so they left the area and went home to give him time. A few hours later, they arrived back at the stand and recovered the blood soaked arrow. This was the sign Tyler was looking for! After a short 100 yard track, they found the buck piled up on the edge of a creek bank and the rest is history. A 170” Indiana giant lay dead after his first and only sit in a tree stand on his new lease. Tyler Shepherd’s 170” Indiana whitetail is the result of hard work, preparation, and sticking to a plan. To watch the video of Tyler’s hunt for Waldo, check out this link: https://www.youtube.com/watch?v=r6fYPPnghJ8&t=7s. For Tyler and his wife Jessica, 2017 was a season for the ages. Both of them were able to harvest remarkable deer with their bows and it was due to the culmination of years of hard work and preparation. Jessica started hunting five years ago and this was her first buck with a bow and biggest buck to date. Through her persistence, even though the horizon looked grim, she was able to wrap her tag around a great buck. Tyler is a huge advocate for quality deer management and consistently passes younger deer to promote an older age class and sticks to a regimented feeding plan throughout the year. Believe it or not, Tyler has not shot a deer in the last four years and many of his friends and family call him crazy. Rightfully so, but good things come to those who wait and it all changed when Tyler made it count on a truly mature buck that walked into range. Persistence and sticking to a plan paid off in the end.